Caster and Uryuu finally return to their lair (where did they go?) 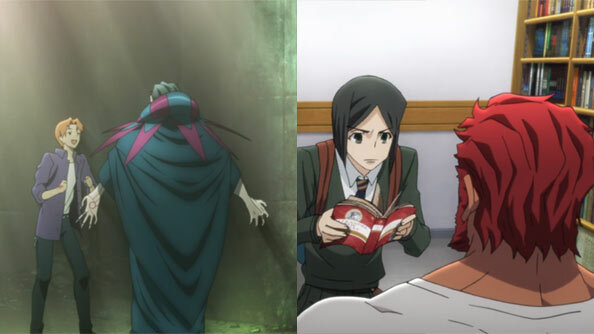 to find all their “artwork” has been burned by Rider, an proceed to have a long conversation about the ephemeral nature of their work and Uryuu’s belief in a god who is eagerly watching and cheering humans on as they find new depths of depravity in witch to toil. Of all the dialogue between Servants and Masters, it should come as no surprise I find Caster and Uryuu’s the most tiresome and least compelling. I mean, both are sociopaths and homicidal maniacs with incredibly twisted views of the world, and have never once demonstrated any hope of redemption. As far as I’m concerned, they can’t be knocked off soon enough, because they are guilty of the worst sin of all: boring me. 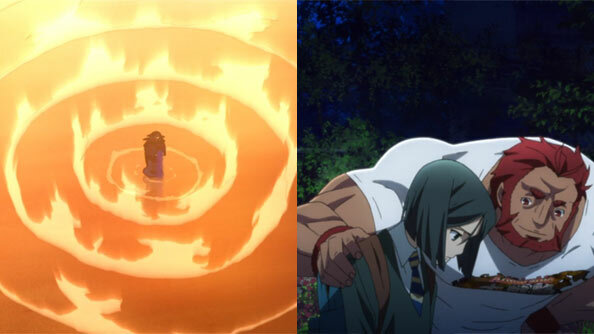 Rider and Waver are far more interesting to watch, both because neither are crazy monsters and they’re not basically the same person. But after his demonstration of power in the Reality Marble, Waver’s confidence has hit a new low. Waver doesn’t believe himself worthy of being Rider’s Master, and while it’s hard for Rider’s attempts to console him to not sound patronizing, he perseveres, telling Waver to have more faith in his ability. After all, stolen relic or not, he would not have been chosen by the grail if he wasn’t worthy. 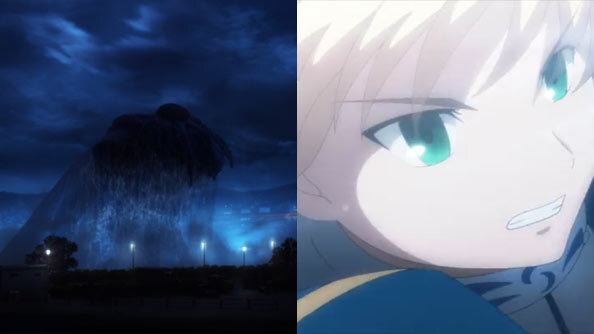 As Caster, encouraged by Uryuu to do something big and flashy for God, strides out into the river to perform some big, flashy spell, Sola-Ui and Lancer, Iri and Saber, and Waver and Rider all sense it, and head to Caster’s location. 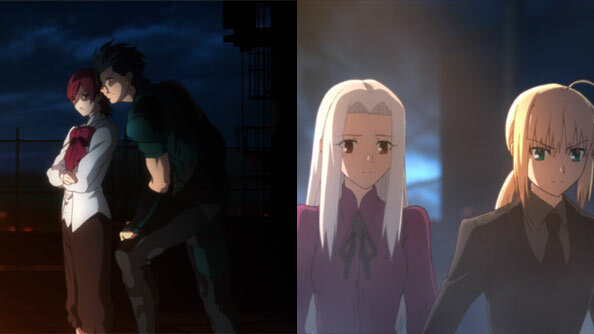 Sola-Ui wants to stand by the Servant she’s fallen for, but Lancer urges her to keep her distance in this case, while it remains to be seen if Iri recovered from her weakness sufficiently to participate in the imminent battle. And what a battle it should turn out to be: Caster ends up summoning a colossal eldritch creature from the deep to ravage Fuyuki. It’s the kind of foe no single Servant will be able to handle, so Rider, Saber, and Lancer agree to a truce and temporary alliance to take out Caster once and for all. The absence of Kariya/Berserker and Tokiomi/Kirei/Archer at the outset of this battle leads me to believed one or all of them will get involved or otherwise take advantage of the fact three of their opposing pairs are busy fighting Caster and his monster off. It will also be interesting to see if, when, and which Master Kirei will attempt to steal in order to fulfill the Grail’s desire to make him a Servant anew.